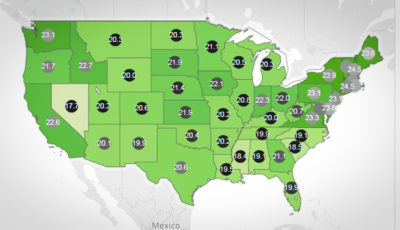 Alabama School Connection » Where Does Your School System Rank? What did you think of when you read the title of this post? Where does your school system rank? Did you immediately think of sports? Well, think again. I’m talking academic rankings. 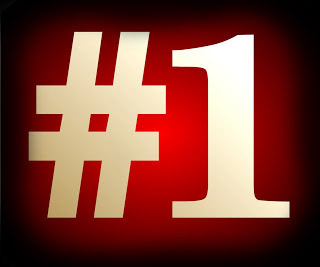 It’s so very important to be #1, particularly in the sports world. Being #1 in the country, in your state, even in your area is a huge honor that reflects months, even years, of hard work and effort. While those who don’t obtain the ranking often have a “sour grapes” reaction, rankings DO mean something. Sports rankings, that is. But do academic rankings mean anything to our public school community? Do you have any idea how your school system ranks in academic achievement? According to the ALSDE’s 2012-2013 Quick Facts, there are 1,496 public schools in Alabama. 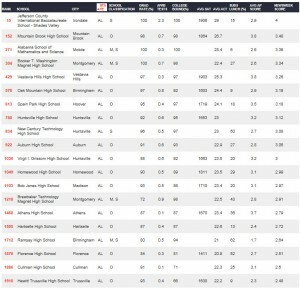 Each year, a few of our 733 Alabama high schools get ranked in national high school rankings…on academics, not sports. Those that make the lists are quick to compose press releases to share the good news with the community. And those that don’t make the list, well, at least in one Alabama school system’s view, they are “not concerned”. Who Ranks Schools and What Methodology Do They Use? Washington Post, Newsweek, and U.S. News and World Report each rank America’s high schools based on their own version of what they believe are measures of a great high school. There are no national rankings of elementary or middle schools. But I did find this Global Report Card that allows you to see where your school district compares nationally and internationally. Very interesting. • Step 1: The first step determined whether each school’s students were performing better than statistically expected for the average student in the state. We started by looking at reading and math results for all students on each state’s high school proficiency tests. We then factored in the percentage of economically disadvantaged students (who tend to score lower) enrolled at the school to identify the schools that were performing better than statistical expectations. • Step 2: For those schools that made it past this first step, the second step determined whether the school’s least-advantaged students (black, Hispanic and low-income) were performing better than average for similar students in the state. We compared each school’s math and reading proficiency rates for disadvantaged students with the statewide results for these student groups and then selected schools that were performing better than this state average. U.S. News’ rankings for Alabama are here. Newsweek released its rankings in early May. Their list is based on six components: graduation rate (25 percent), college acceptance rate (25 percent), AP/IB/AICE tests taken per student (25 percent), average SAT/ACT scores (10 percent), average AP/IB/AICE scores (10 percent), and percent of students enrolled in at least one AP/IB/AICE course (5 percent). Click the link for full methodology. 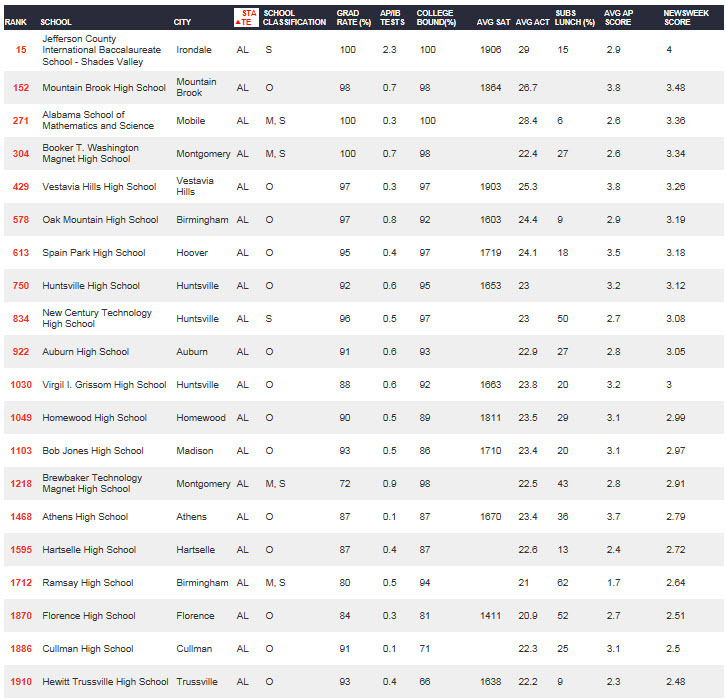 Here’s a screenshot of the Alabama high schools that made that list. To Whom Do Your School Principals and Administrators Compare Themselves? These three ranking methodologies are certainly not perfect. They measure results, not effort. Even those that use multiple indicators cannot fully capture all that high schools achieve that meet a school community’s definition of success. But they are measuring SOMEthing. And it is in those measures that we get a glimpse of where our schools fall in the world of competitive academics. To whom do your school leaders compare themselves? 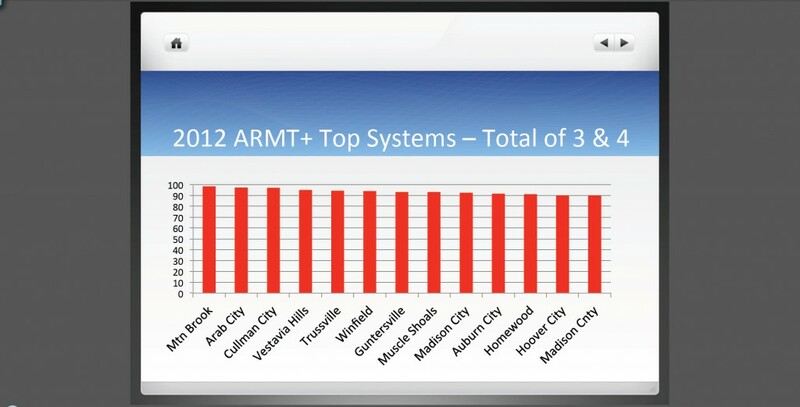 Here is Vestavia Hills City school system’s 2012 assessment report, looking at where they stand with respect to other city school systems for the 2012 ARMT results. So that’s their basis of comparison: other city school systems. If you look at Mountain Brook City schools’ assessment report from last October, you will see that they make no state comparisons, only national comparisons. Which shows their school leaders are clearly focused on being nationally competitive in the measures on which they choose to focus. I was unable to find any other school systems’ reports that were like these, looking at assessment results and utilizing some kind of comparison basis. 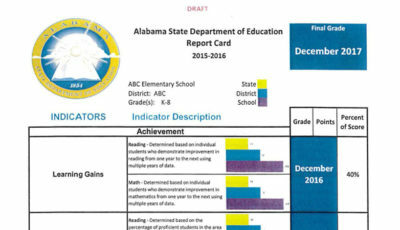 The Public Affairs Research Council of Alabama (PARCA) assists Alabama’s school systems by compiling comparison reports on many parameters including achievement and spending and sharing it with school community stakeholders. Here is a report they prepared for Dothan City Schools in mid-2012. This image, taken from the report, clearly indicates to whom Dothan City school leaders choose to compare themselves. Here’s a presentation that PARCA put together for Jacksonville City Schools. It reveals to whom Jacksonville City school leaders compare themselves. So to whom do your school and system leaders compare themselves? If you don’t know, the summer is a great time to start these conversations. I have loaded ALSDE-produced ARMT results for all students, for each grade, for each math and reading into a few tables for your viewing pleasure. You can find a permanent link to these rankings on the menu at the top of this page. These tables will show you a crude ranking, 1 through 132, based on the percentage of students scoring at Level 3 and Level 4 of the ARMT. You can click the header row to re-order our school districts based on one of the variables listed. Remember, this table is based on one variable and it is all student subgroups (e.g., White, Black, Non-Poverty, etc.) combined. But it is a good indication of a place to start the dialogue. If your system is lower on the list than you expected, start that conversation. While it would be wonderful to have an ALSDE-produced database to allow these types of rankings based on multiple factors, including enrollment, free and reduced lunch recipients as a percentage of the student population, graduation rate, etc., no such database currently exists. I plan to add to this table/ranking system as time allows. If you have a variable that you would like to see added to the database, please let me know. If it is freely available, I will do my best to add it. 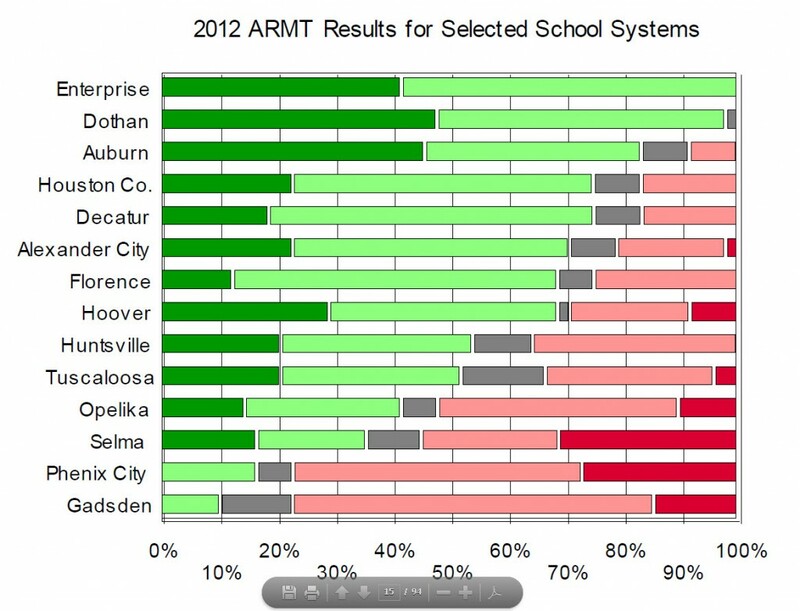 First, check out where your school system ranks on the ARMT, grades 3 through 8, reading and math. Then dig a little deeper into results that PARCA offers. These two sets of results should give you a great place to start asking questions. 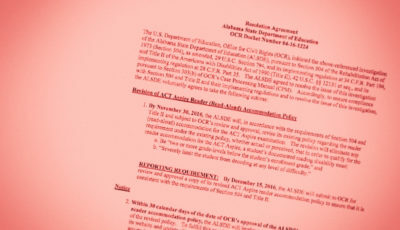 (1) Do we have a document, other than the simple AYP Yes/No, Pass/Fail document, that sums up our ARMT and AHSGE (high school graduation exam) results? (2) To whom do we compare ourselves? (3) Specifically, what are we doing to improve student achievement? If the answers are less than complete, encourage your school and system leaders to begin developing some comparison tools. Everybody can be compared to somebody. Which system’s results do you want to shoot for? Do you want to set your own bar? Again, the summer is a great time to have this conversation. If I can put together a table/ranking database from information available for free from the ALSDE using an Excel spreadsheet and a free table plug-in for WordPress, imagine what your school and system leaders can do with better and more meaningful internal data. Even if these conversations make us uncomfortable, we must have these conversations. Priorities can be set, plans can be made. 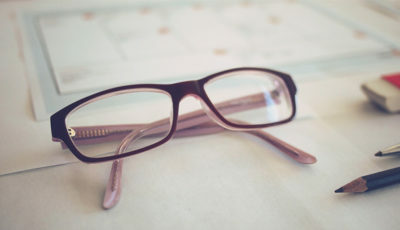 Your school community deserves the opportunity to discuss whether those high school or other rankings matter, and if so, where you’d like to see your school and system place in the rankings. NOTE: If need be, please re-read “Stop Buying the Lie That Children in Poverty Can’t Learn at High Levels“. As always, let’s discuss here or on the facebook page.